From H.B. Barstrum, the author and poet of the Inspirational Stories of Faith, The Clean Romance Chronicles and Haiku Poetry Collection series comes book two of the Inspirational Books of Life Lessons Iron Lung. In this, inspirational sports story, fifteen-year-old Ben Tisdale has been all about swimming ever since he was a small child. However, due to tragic life situations, his dreams of continuing his swimming pursuits were stopped cold. When a seemingly golden opportunity presents itself for Ben to recapture his former glory, he finds himself up against difficult challenges. Challenges like an over protective mother and a life threatening secret that he cannot escape from no matter how hard he tries. All of which threatens to stop him before he even has a chance to realize his dreams. What happens to Ben? And will he be able to beat the odds and score the opportunity of a lifetime? This is not just an inspirational book for teens or a swimming story. Iron Lung is a tale about the battle to dream big and chase your heart’s desire. A great reminder for people of all ages and walks of life. Closing the rusting dark blue locker, my heart feels like it is thumping harder and faster. Like one of those crazy drum solos, my favorite drummer John Bonham from Led Zeppelin would play at a live show. That is if I were old enough to go to a show when he was still alive. I adjust my form fitting black and gray LZR racer Speedos swimsuit, wishing there were some form of more civilized, swimwear to dress in that did not feel like a wetsuit gone wrong. Brushing my hands against my sides, I am in the midst of a desperate attempt to keep them busy before grabbing my towel, swim goggles and iPod. Even though the temperature outside is about ninety degrees, my hands still feel tight, cold, and clammy. My head is spinning like an out of control child's toy. Oddly, my hearing seems to have become muffled and fuzzy. And although, the locker room is full of fellow swimmers, I feel like I am the only one in here. I know my whole body is tense. The slightest distraction could probably cause me to jump out of my skin right about now. "Why is all of this happening to you?" you maybe asking. Well in about twenty minutes, my entire world is about to change. Like seriously though. I really think my life for the last six years has been building up to this very moment. As sure as I am standing here before you, a transformation has been flourishing and blooming. Now, I am about to see if my harvest will be everything I hoped it would be. Hold on. Wait a minute. I think I may be getting ahead of myself here. Time for me to pull back. I need to explain something that’s real important. Until you know about the series of critical events that led up to me standing in this locker room here in Omaha, Nebraska, I feel you will not fully grasp the significance of this situation. With that said, let me begin. P.S. Make sure to scroll up below to buy your copy of Iron Lung right now. 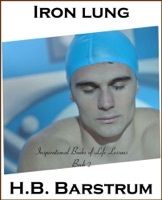 Finally I get this ebook, thanks for all these Iron Lung: Inspirational Books of Life Lessons Book 2 I can get now! Iron Lung: Inspirational Books of Life Lessons Book 2 was the best books I ever buy. Iron Lung: Inspirational Books of Life Lessons Book 2 did exactly what you said it does. I will recommend you to my colleagues. Iron Lung: Inspirational Books of Life Lessons Book 2 is the most valuable books we have EVER purchased. I'd be lost without this. I am completely blown away.